Special Interests: Food animal surgery and medicine, large animal obstetrics, small animal soft tissue surgery It is easy to say Dr. Saintsing has a passion for veterinary medicine, she has been working at a veterinary hospital since she was 14. She completed her undergraduate degree in Animal and Poultry Sciences at Virginia Tech in 2007. She then went to Ross University for her pre-clinical veterinary training and Auburn University for her clinical veterinary training. During her time at Auburn University she “tracked” food animal and though her main interest are Food animal surgery, medicine and obstetrics, she has always enjoyed working on a variety of animals. 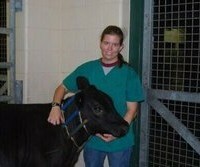 While at Virginia Tech she worked as a Zoo keeper and performed a zoo veterinary externship. Prior to going to work for Blue Ridge Veterinary Services worked for 2 years at a mixed animal practice. Dr. Saintsing lives in Sparta, NC with her Husband James, dog “Hokie”, mules “Doc” and “Daisy” and the occasional bovine. When not working she enjoys Hunting, Fishing and traveling with James. Dr. Saintsing is available for appointments and ambulatory services at our Galax office on Mondays and our Mount Airy office on Tuesdays, Wednesdays and Fridays.